This section to Arrowtown follows cycle trails, but there are a number of them, and there is no TA signage. Try and stay on the Queenstown Trail. When you get to Frankton things get a bit confusing, but if you approximately follow the map it will be fine. While here you can take a detour to the shopping complex on the far side of the airport where there is a large New World (and an outdoors store) for resupply (save you carrying more food to this point anyway), but much closer to the trail is a large Countdown supermarket further along to your right, just before Grant Rd. You continue alongside the main road past this supermarket, and a huge Mitre 10 Mega to Glenda Drive. Go right into Glenda Drive and just at a point when you think you are going in the wrong direction turn left into an inconspicuous lane called Margaret Place. Go down here to the Shotover River, and across the old historic bridge (past the new road bridge). Then it is a circuitous but well signposted route to Lake Hayes that follows the river before entering a surreal subdivision known as Hayes Estate. Don’t expect to find any shops (or many signs of life) here. When you reach the main road, cross over and walk a short distance east along it to pick up the track around the lake. This ends at Rutherford Rd. Continue up that, turn right into Slope Hill Rd, then right again into Speargrass Flat Rd. A short distance along is a track to the left taking you uphill on the Millbrook Track and into another surreal experience, the perfectly manicured and very green Millbrook Resort. The route through the resort is well signposted. You end up at the main entrance road, The Avenue, an avenue (naturally), of trees leading to the main road, Malaghans Rd. Turn right into this and almost immediately take a left turn into Manse Rd. This turns into Caernarvon St. You can branch off to the left to Wiltshire St for the centre of town or continue on to Kent St. At the end of Kent St you come to a park and across that you will see the Arrowtown Holiday Park. Arrowtown Holiday Park – 12 Centennial Avenue, 03 442-1876; 03 442 1421. This appears to be the only cheap accommodation in Arrowtown. There is a small supermarket near the camp ground that staff can direct you to (at 32 Adamson Drive). This might save you carrying food from Queenstown, but bear in mind that the choice is more limited and expensive. Arrowtown is a gentrified tourist town, so offers little in the way of general supplies, though there are plenty of cafés and restaurants. Arrowtown Night n Day Food Store – 39 Buckingham St, Arrowtown. The next section takes you over several reasonably high passes and through an abandoned settlement to another tourist town, Wanaka. The Motatapu Track is exposed and physically demanding. There is little or no water above the valleys and conditions can be very hot and dry in summer but the possibility of wintry conditions exists at any time of year. From the camp ground head north-west via Cardigan St, followed by Hertford St, then turn right into Wiltshire St and left into Buckingham St through the centre of town (or go further down towards the Arrow River and walk along Ramshaw Lane). You will see riverside parking and picnicking areas where Ramshaw meets Buckingham. Head west by the river and you will see the river route around to Macetown along a 4WD track. You could take this if the weather higher up is not going to be good (there is also an exit point up the hill down Sawpit Gully to the river track if you change your mind on the way up). Continue further and a signpost for Big Hill Track comes into view. This takes you up through forest and then into the open. After a steep climb you go over Big Hill Sadlle at 1060m. 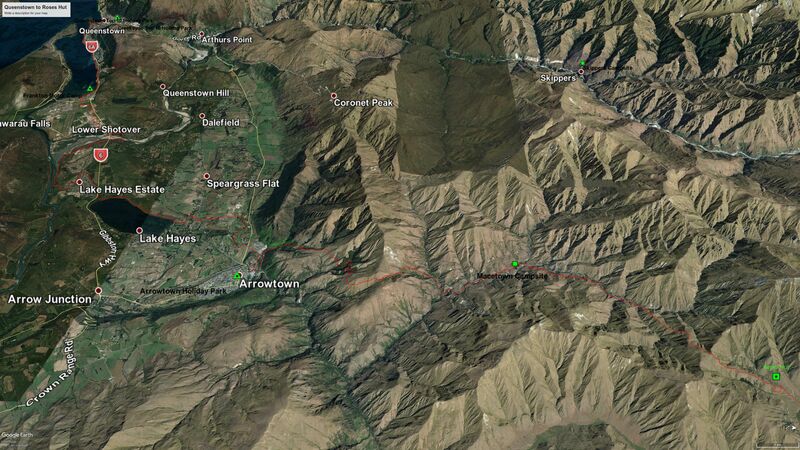 There are great views here over Arrowtown, Lake Hayes and through to Frankton. At the bottom of the other side you join the Arrow River again and meet up with the 4WD track. This takes you to the deserted gold mining settlement of Macetown, which is a lovely spot for camping, though sandflies can be a problem. There is a toilet and some campsites a few hundred metres past Macetown and down by the river. You are not permitted to stay or light fires in the historic buildings at Macetown of course. There are two options up the Arrow River that branches off to the right. One is to walk up the river, but much of the time will be spent wading in the river itself, or fighting the spiny matagouri bush on the banks if you try to keep your feet dry. The river route can only be done when the water flow is low. The other is the route marked on the map that sidles up and down to the right of the river. Its start is marked, but if you miss it and come to some abandoned digging machinery you have gone too far by a few hundred metres. It’s a toss-up whether to take the river or the high route. One means wet feet and slow going; the other entails a lot of up-and-down walking, and is perhaps equally slow. Either way you eventually get to a point east of Roses Saddle at 1270m and from there it is a straightforward descent to Roses Hut on the other side. You’ve just climbed two major hills, and now there are two more. The first is a steep, tough climb up from Roses Hut over to Highland Creek Hut. You might want to stop at Highland Creek, and do 6 hrs 15mins to Glendhu Bay the next day, or do another 3.5 hrs to Fern Burn. 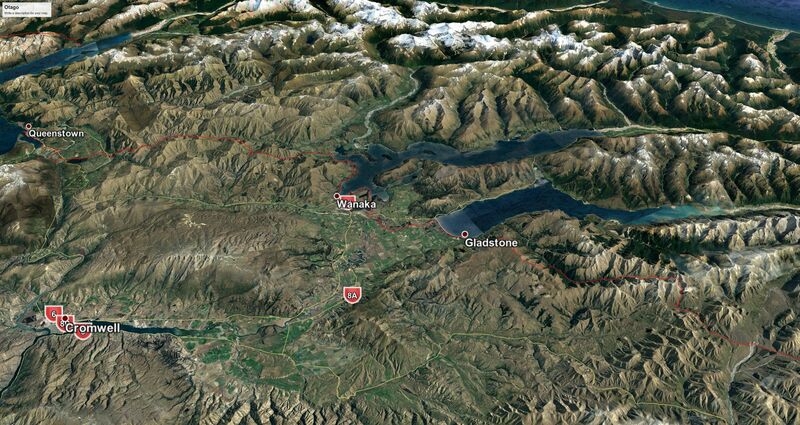 From that hut you can skip the Glendhu Bay motor camp to get to Wanaka in one go. Now there is another climb over the Jack Halls Saddle to Fern Burn Hut. Like Highland Creek and Roses huts, this is a modern hut of a standard design with two sleeping platforms at one end. It is easy walking down to the Fern Burn car park (2 hrs 15), where there is a toilet, and a further 30 minutes to the large Glendhu Bay motor camp. The camp can be a bit windy and the camp shop is only open in the summer to 7 February. The cycle and walking track around the lake edge starts at the eastern end of the motor camp. It finishes at a park on the waterfront at Wanaka. Keep going in the same direction to reach the centre of town. YHA Wanaka Backpackers (aka Purple Cow) – 94 Brownston St, 03 443 1880. Mountain View Backpackers BBH – 7 Russell St, 0800 112 201 or 03 443 9010. Base Backpackers – 73 Brownstone St, 03 443 4291. Matterhorn South BBH – 56 Brownston St, 03 443-1119. Wanaka Bakpaka BBH – 117 Lakeside Rd, 03-443-7837. Flying Kiwi Backpackers – Russell St, 03 443 6723. No website: book online on hostel booking sites. Holly’s Backpackers BBH – 71 Upton St, 03 443 8187. Wanaka Kiwi Holiday Park and Motels is further out of town (about 30 mins from the centre, but not too far from where you arrive on the trail). It may have more vacancies than the big one in the centre though) – 263 Studholme Rd, 0800 229 8439; 03 443-7766. There is a major supermarket in the centre of town: New World Supermarket, 20 Dunmore St. Also the smaller 4 Four Square Supermarket, 70 Ardmore St, and Wanaka Night ‘n Day, 80 Ardmore St.
Plus a health food shop/café (Soul Food, 74 Ardmore St) and the Mediterranean Market (20 Ardmore St), both of which are good for legumes, nuts and stuff you can’t buy in the supermarkets. There are several outdoor supplies shops in the centre of town. This goes around the waterfront to the lake outlet. It’s a well-defined walkway. When you reach the Lake Outlet Holiday Park there is a DoC sign down to the Lake Outlet Walking track. Take that. Then you cross the Clutha River bridge (or take a short diversion to the Albert Town shops 200m at right to get an icecream beforehand). At left is the Albert Town Campground with few facilities. Then it is across the road and onto dirt roads that follow the river. These come to another basic camp ground. Head diagonally across to the suspension bridge. The trail is clear and well signposted from this point. Near the very end you can avoid taking the exit to the right to Domain Rd and instead continue all the way to the lake dam. Head up to the main road at right and you will see Capell Ave. Lake Hawea Hotel is near its beginning and offers pub food and various types of accommodation. It has a hostel block, though this is not promoted. With limited accommodation in Hawea the place can be booked out. There is a general store (named Sailz) with a café and takeaway counter further up the road (33 Capell Ave) that is open until 9pm and which apparently has a TA visitors book. And there is a camp ground about 1km out of town on the western side of the lake. Lake Hawea Hotel – 1 Capell Ave, Lake Hawea, 03 443 1224. There are bike hires here – you could enquire if you could pick up one of their bikes in Wanaka and drop it off at the hotel to avoid this rather boring stretch of walking. Lake Hawea Motel – 56 Capell Ave, 03 443 4510. Lake Hawea Holiday Park – 1208 Makarora-Lake Hawea Road, 03 443 1767. The first section is along the lake front to Gladstone (1.5 hrs) and another 800m around the lake on Timaru Creek Rd. Then it is a very strenuous climb up a zig-zag track to a ridge and on to Breast Hill at 1578m and fantastic views out over Lake Hawea and across to the Southern Alps, including Mt Aspiring. You can dip 200m off the track before Breast Hill for Pakituhi Hut, or continue on. There is an alternative route from Pakituhi Hut towards the 4WD road leading to Stodys that can be used in bad weather and which avoids the climb to Breast Hill summit. Unless there is some at Pakituhi Hut, there is no water source from Gladstone to Stodys. The route from Breast Hill to Stody’s is up and down farmland along a 4WD road with great views on a good day. Stodys Hut is a small, very basic shepherds hut with a dirt and stone floor. It is now straight down to Timaru River and then on a track that sidles it, going up and down repeatedly, at times quite steeply. There are some grassy areas along the track by the riverside that are very suitable for camping, especially a large one about half way along, though sandflies are ever present. There are also up to ten or twelve stream crossings, so wet feet are inevitable. The river valley eventually opens out onto farm land and a 4WD road and it’s then 20 mins from the forest edge to the modern Top Timaru hut. The trail continues along a 4WD track up the valley, ending in a zig-zag up to Mt Martha saddle (1680m), and then winds down the other side to Tin Hut, a run-down hut (complete with arm chairs) that would be a welcome port of call in a storm, although the wind blows through its many gaps. It is a bit rough to stay in but arguably better than a tent. The water in the nearby creek should probably be treated before drinking due to farm animals. It is then a further 2 hrs to the Birchwood car park (aka Avon Burn car park). The track takes a sharp left turn away from the road at the intersection of grid reference lines 1333 & 5074 as you follow Avon Burn near the Ahuriri River valley, and then runs parallel to it at left, but this left turn is easy to miss. You will cross Birchwood Road. If you wish to exit the trail, Omarama is 29 km down river and has a motor camp and other accommodation as well as a Four Square. There is little traffic on Birchwood Rd if you want to catch a lift however. The descent down into the river is extremely steep. There is a farm road to the left if you wish to detour a bit and take a safer route. Orange triangles on green boards mark the crossing point of the Ahuriri River. If the Ahuriri cannot be forded safely go downstream for about 5km to the Ireland Road Bridge and then back up the other side. From the Birchwood car park it is 1.5 hrs to the far end of the pine plantations on the opposite bank. You will need to find somewhere to camp in this area. Perhaps up the Ahuriri River East Branch valley, but there are no ideal spots. Or you could keep walking and cross the river over to the East Ahuriri Hut, a disused musterers’ hut from the 1890s nine km from the Ahuriri River, at grid ref 1341 / 5084. It is run down, but may be being fixed up.